A mysterious giant hole has suddenly appeared at Yamal,translates as the "end of the world", in Siberia, Russia. Yamal holds some of Russia's largest gas reserves and the crater appeared less than 20 miles from the biggest gas field, Bovanenkovo. 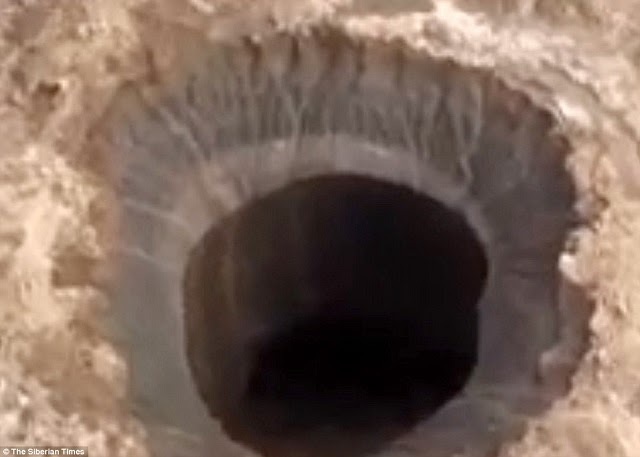 The hole is about 262 feet (80 meters) in diameter and it certainly doesn't look like a sinkhole, although you can see a large cavern under it. The dark colour of the crater's sides was said in a Zvezda TV report to indicate "temperature processes" or burning. Whatever caused it, it is large enough to comfortably fit several military helicopters in the entrance. 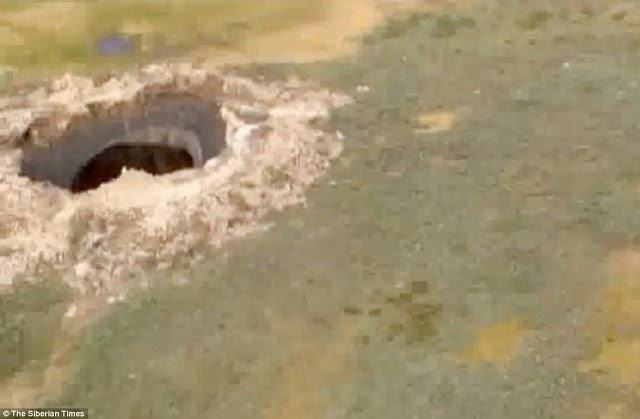 Some have speculated it could have been made by a meteorite striking earth, an underground explosion, or is a sinkhole caused by collapsing rock, the Siberian Times reported. Anna Kurchatova from Sub-Arctic Scientific Research Centre thinks the crater was formed by a water, salt and gas mixture igniting an underground explosion, the result of global warming. She postulates that gas accumulated in ice mixed with sand beneath the surface, and that this was mixed with salt - some 10,000 years ago this area was a sea. Talking to The Sydney Morning Herald, polar scientist Dr. Chris Fogwill says it's likely to be a geological phenomenon called a pingo—a block of ice that's grown into a small hill in the frozen arctic ground.